The Prefecture of Chania is the western most division of the island of Crete. The Prefecture of Rethymno forms its eastern border, whilst sea lap its remaining areas. The inhabited islands of Gavdos and Gavdopoula, which are located at a distance of 20 miles south from Chania, in Liviko Sea, also come under Chania. The major cities of the prefecture are Chania, the capital of the prefecture, and Kastelli in Kisamos. Among the most important villages are Paleochora and Kantanos in Selino, the Chora of Sfakion in Sfakia. The Prefecture of Chania provides tourist services and activities of all kinds, satisfying all the choices. The city of Chania maintains unaltered all of its characteristics, from the time of the Venetian Rule up until today. The White Mountains, that are towered behind Chania and sink into the Liviko Sea in Sfakia, have a lot of gorges and ravines for nature lovers or enthusiastic climbers. 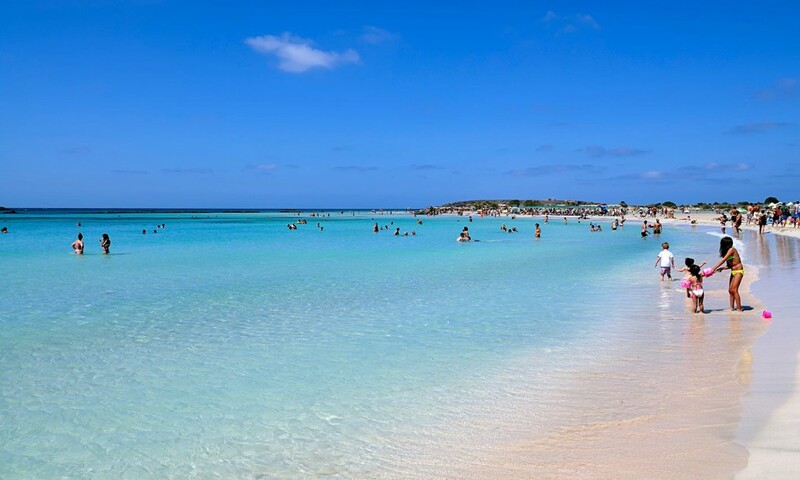 The sandy beaches and the crystal clear waters in Falasarna, in Paleochora and in Georgoupolis are ideal for swimming. The Minoan, the Roman, the Byzantine and the Turkish archaeological sites are particularly attractive for those interested in cultural and historical explorations and information.Un unforgettable experience is crossing the gorge of Samaria -on foot- as well as the journey that follows up to the Chora of Sfakia by boat. The economy of the Prefecture of Chania is rural. The fertile flat plain and the good climate offer a rich agricultural production. The most important products are olive oil, grapes, wine, citrus fruits and trees and particularly citrons and raisins. The Chania prefecture is full of beaches both on the side of Kritiko sea and the side of Libyan Sea. Close to the city of Chania you will find Chrisi Akti and Platania beaches, while in Maleme is a great in length sandy beach. In Akrotiri you will see unique sceneries on the coasts of Marathi and Stavros in Kalatha bay. In the west side of the island is Falasarna with an amazing sandy beach and smaller isolated bays. At the end of Gramvousa cape is the beautiful Balos beach. Some other beaches are Elafonisi with its pink sand and the islet in the very middle of Libyan sea (south), Paleochora with a beach full of pebbles, Sougia a vast beach with fine pebbles and vast deep blue waters, Aghios Pavlos Sfakion and Iliggas with its emerald waters surrounded by high rocks, virgin sceneries and the famous Fragkokastello with its imposing Venetian castle at the end of the sandy coast. The Archaeological Museum of Chania is housed in teh building of that once was the catholicon of the Monastery of Aghios Fragkiskos, built in the 16th century (30, Chalidon street). The museum houses a great collection of findings discovered in the wider area and date back from the Neolithic until the Roman era. 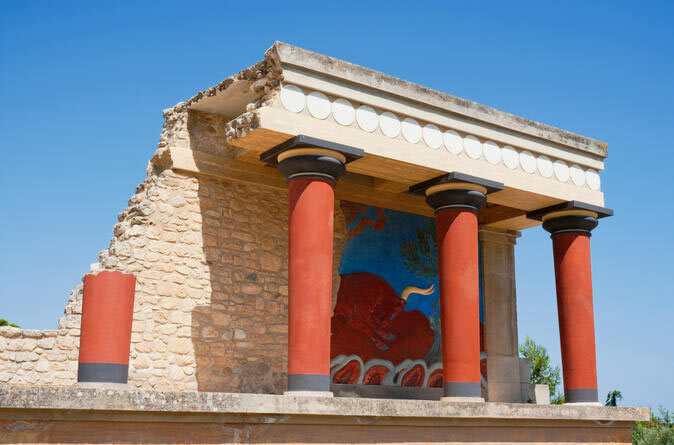 Your guided tour of the museum will offer you the opportunity to observe findings of the Minoan period and inscriptions of Linear A and B. The findings dating back to the Historic period are also remarkable. The exhibition comprises of statues dating back to the Classic period as well. Moreover, you can observe the interesting collection of mosaics dating back to the Roman period and the early Post-Christian years and representing Dionysus, Ariadni, the town of Chania, the liberation of Nymph Amymone by Poseidon among others. The Byzantine Museum of Chania (82, Theotokopoulou street) exhibits excavation findings as well as collections and items donated by private individuals dating back from the Paleochristian years until the Turkish occupation. The exhibits are organised in sections and each section is part of a chronological order and includes mosaics, frescos, images, ceramics and other items. The museum intends to present the historical and artistic course of the Prefecture of Chania during the Byzantine and Post-Byzantine years. The Maritime Museum of Chania is housed in the Firka building (1629), which has been renovated, in Topana quarter, Kontourioti coast. Its collection comprises various representative exhibits of the Greek maritime history and tradition, which are classified in sections covering the Copper Era until the present times. Among these, you will see models of ships of all periods, items recovered from the seabed, maritime instruments and navigational accessories, maritime maps, paintings and photographs as well as a shell collection.The Museum of History was founded in 1932 and is housed in a two-story neoclassical building (20, Sfakianaki street). The Historical Archive comprises 6,500 books as well as a wide range of historical documents, such as the archives of the Turkish administration of Crete ans the ones of the Cretan State or the private correspondence of Eleftherios Venizelos. It is probably the second richest collection of archives, the first being that of the State General Archives of Greece. Private Folklore Museum (46b, Chalidon street). The museum is housed in a room of the Municipal library, the entrance of which is located in the precinct of the Catholic Church of Chania. Its collection comprises popular art and tradition exhibits that give visitors the possibility to discover the life of the island during the 18th and 19th centuries, as well as a remarkable collection of laces and embroideries. The Public Chemical Laboratory of Chania, established in 1830, was the first official laboratory carrying out analyses of foodstuff and products in Greece and it was equipped with the finest intruments of that period. The Chemistry Museum, nowadays housed in the building of the General Chemical State Laboratory of Greece (34c, Eleftheriou Venizelou street, tel. : 28210-42504) because its original fecilities where destroyed during the World War II bombings, provides an accurate representation of the Public Chemical Laboratory facilities in the beginning of the century, including working surfaces, glass containers, explanatory tables as well as photographs taken from the manuals of that period. Having returned from the guided tour of the cape of Gramvousa, you will descend towards the south and west coastline towards the destination of the notorious Falasarna. In order to reach Falasarna you must get to Platano and from there turn north towards Kavousi by following the signs. Travelling towards Falasarna you will have a majestic view of the ruins of the ancient city, the dense vegetation and the blue sea. Ancient Falasarna was the seaport of Polyrinia in ancient times which provided the powerful city great security due to the impregnable fortress it provided. As a city with a naval station it played an important role in trade and shipping, which brought anologous wealth and managed to surpass Polyrinia in development. It also had its own currency whose one side depicted the head of a woman and the other the letters F ? in between a trident.The city seems to have already been founded in historic times even though its name is Pre-Hellenic. At the archaeological site of the city you can see today remains of its walls which must have certainly been very strong, judging by their size.A stone throne which possibly was dedicated to Poseidon or Diktyna also survives as well as the remains of the acropolis on the rise of the hill. At the site carved tombstones were discovered as well as relics of the temple of Apollo and Diktyna. Following the northern road axis towards Rethymnon and at a distance of 15 km from Chania, you will visit the site where the ancient city of Aptera was built. The ancient city of Aptera was one of the most important ancient city-states in western Crete. It was founded in the 7th century B.C. and was completely destroyed in 823 A.D. by Saracene pirates after having achieved a glorious past for centuries. The place-name is attributed to Aptera or Ptera who was its founder and leader. According to another version of the story, it was called Aptera by the Sirens who establised “the city Aptera and the islets of Leukai” after their defeat in the race with the Muses. It is also believed that they fell into the sea and in this way the islets Leukai were created in the bay of Souda. The finds give evidence that it was inhabited from the archaic period up to the Byzantine years and developed important commercial activity. Archaeological excavations show a small Sanctuary most likely dedicated to the goddess Demeter. Statues, epigraphs, epitaph pillars and ceramics which today decorate the showcases of the Archaeological Museum of Chania have been discovered. You will also see at the site relics of a small theater, foundations of houses, carved tombs- of the Roman Age – and many large dome-shaped reservoirs of which one well-preserved is divided into three sections. Also found in the vicinity were coins that give evidence of the autonomy of the city.